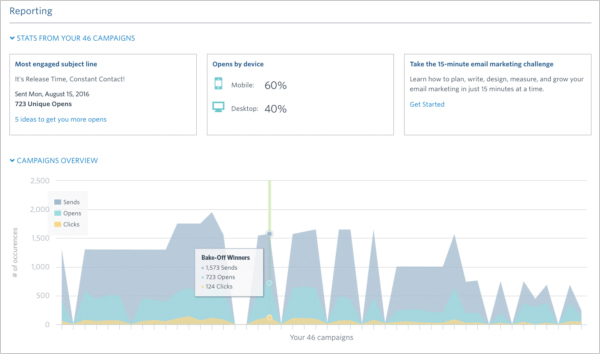 Start by taking a look at the open and click-through rates of your latest email campaigns. Then, compare your results with averages in your industry. Constant Contact’s Industry Average Chart makes it easy for you to see how your campaigns stack up in relation to others in your industry. And you might find it encouraging to know that if you’re currently getting at or above a 17 percent open rate and a nine percent click-through rate, you’re in good shape across the board! For any industry, that’s a positive level of engagement. Now that you have a good benchmark to start with, it’s time to go beyond opens and clicks and see how your emails are impacting your bottom line. Your marketing campaigns must support your business goals; otherwise, why go through the trouble? We’ve created worksheets to help you keep track of email marketing metrics and business goals so that you always have a clear picture of how your marketing efforts are working to support your business. • Sending a general newsletter? This worksheet is for you. 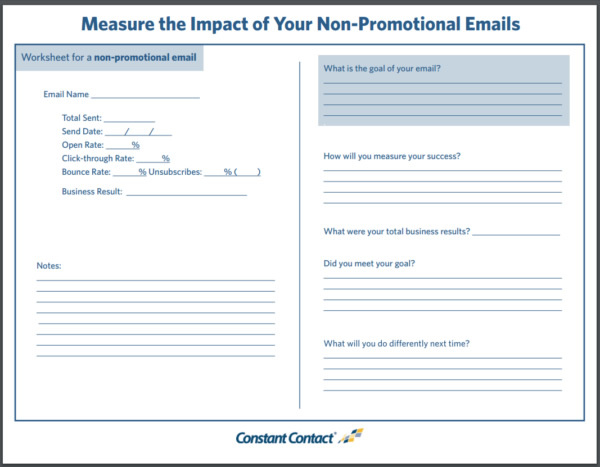 Before you even send an email campaign, start filling out the worksheets by answering two important questions: What is the goal of your email? And How will you measure your success? To identify your goal, think about what it is that you’re hoping the campaign will achieve. Are you hoping to gather more registrants for a fundraising event? Do you want to sell 20 percent more items than last year? Are you looking to get three new consultations booked? Whatever your goal is, the more specific you can be the better. That way you’ll know in just a glance if you hit the mark or not. After you’ve sent your email, visit your email reports a couple of days later and fill out your worksheets with the results. Tip: You can require that subscribers provide a reason for opting out from your emails. The final step is where the marketing magic happens. For a non-promotional email, this should be pretty straightforward. 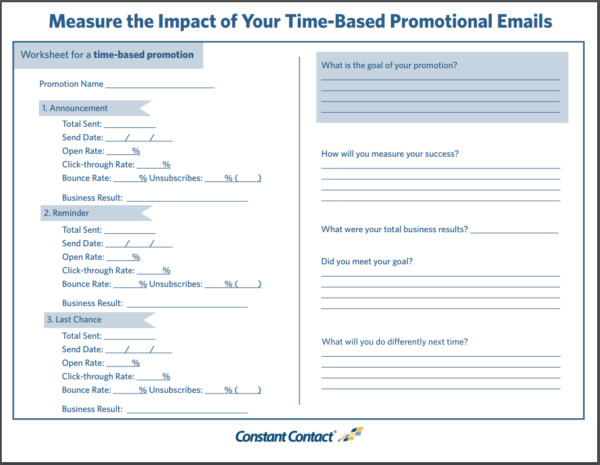 For a time-based promotional email, compile your results to get the total business result. That should be a simple yes or no answer, based on the goal you set at the beginning. Once you have figured out how an email performed and how it helped you reach your goals, adjust your strategy to optimize your marketing. • Review the calls to action in your email. Consider the wording of your call to action — is it clear and intriguing? Is it telling people exactly the action they should take and why it matters to them? • Create more white space so the email doesn’t feel overwhelming. If your email contains multiple sections, break up different topics so readers can choose what they want to read. You may also want to try breaking up each topic into separate emails to send shorter emails more frequently. • Think about how much content is in your email. Stick to a picture, a paragraph, and a strong call-to-action that’s easy to find and click. If you have too many calls-to-action (or none at all), readers will not know what you want them to do. 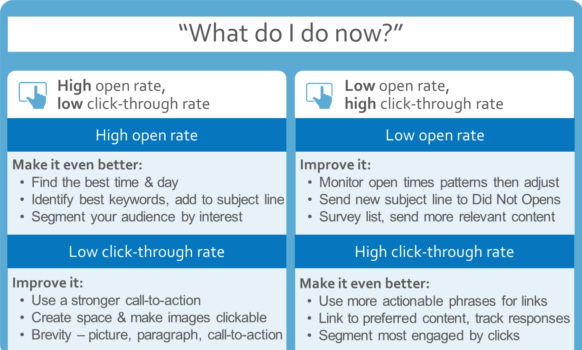 What should you do if you had a low open rate and a high click through rate? This tells you that although not many people opened your email, the ones who did were very interested in your content. • Find your best time to send – Are you sending at the times and days that the majority of your subscribers are likely to read your email? Here’s how to find the best time for your business. • Try a different subject line. Make a copy of your sent email and try re-sending your email with a better subject line. Don’t re-send to your whole list; only send to the contacts in the Did Not Open list of your email. Then, you’ll have two separate reports to compare with the Campaign Comparison Tool to see which had the better open rate. • Make sure your emails are relevant to your audience. Keep track of topics that are popular for your audience. Survey them with a poll to nail down what they want to read. This chart will help guide you along when it comes to adjusting your marketing strategy, to continue to improve your marketing and reach your business goals. Measuring your email marketing is not everyone’s favorite thing to do — but knowing what’s working and what isn’t will save you time, effort and money in the long run. And that’s certainly something to get excited about. This post was first published by Constant Contact, here. Constant Contact is a longtime supporter of the SBDC network, providing an easy-to-use Email Marketing tool and free education to all chapters and clients for over 10 years.